Staples might just be your last stop since they don’t open until 6:00am on Friday. Most of their items will be very limited in quantity and the sale will only run until noon. Head over and preview the entire ad before you go. So far these prices are much lower than Amazon can offer. That might change as we get closer to the date. The Kindle is a great deal with the added gift card. 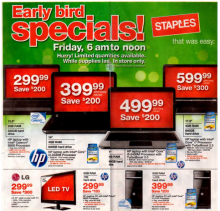 Stores Nov 12, 2011 in BlackFriday, Staples · Expired! I know printing coupons can be hard on our pocketbooks when you have to buy paper and ink to print them. Every once in a while, we’ll get an offer like this that makes that a little easier! Get a free ream of HP Paper after Easy Rebate with this coupon. Plus there is a $1 off HP Paper Coupon. With both of these coupons, you’ll get free paper and make $1! This offer is only good today, April 19th. Limit is one per household! Coupons Apr 19, 2011 in free, Staples · Expired!